Orphaned and left to care for her four younger sisters, Nassali is burdened with daily household chores while her brother goes to school. Nassali knows this is not fair and challenges her uncle, grandmother and brother because “Maama always said an education is the path to a better life.” Nassali dreams of going to school and tries to make sense of the squiggles in her brother’s school book. She even sneaks all her sisters to the school so she can look after them while listening outside the window. Her brother finally takes pity on her and shares her chores once a week—gift days—so she can practise reading and writing. Through perseverance and her brother’s support, Nassali is able to learn to read and write and eventually go on to university as she had always dreamed. Education is a human right, and for Nassali it is a priceless gift. 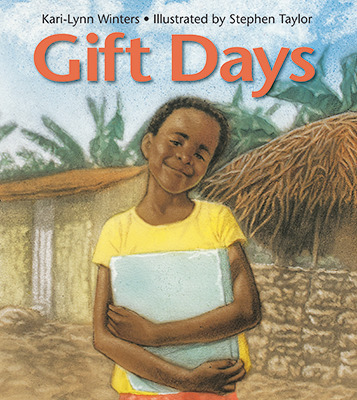 The story is infused with vocabulary from Nassali’s language so that readers are whisked away to her ekyaalo (village) to experience her story first hand (and there’s a helpful glossary in the back). Classroom Connections: This book gives a firsthand account of a girls’ struggle toward education and the barriers that keep her from school. A short non-fiction explanation at the back of the book details the many barriers that children face when seeking an education. Perfect for a read aloud or as part of a theme study. Reading Comprehension Strategies: making predictions and making connections.